Gerhard Böwering, Ph.D. (1975), McGill University, is Professor of Islamic Studies at Yale University. He has published widely on early Sufism, including The Mystical Vision of Existence in Classical Islam (DeGruyter, 1980) and The Comfort of the Mystics (Brill, 2013). Yousef Casewit, Ph.D. (2014), Yale University, is an Instructor of Arabic Medieval Heritage and Culture at the American University of Sharjah. He has several forthcoming articles and a monograph on the formative period of mysticism and the teachings of the Muʿtabirūn tradition in al-Andalus. 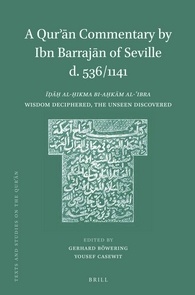 A Qurʾān Commentary by Ibn Barrajān of Seville (d. 536/1141) is a critical Arabic text edition of a medieval Muslim Qurʾān commentary entitled, Īḍāḥ al-ḥikma bi-aḥkām al-ʿibra (Wisdom Deciphered, the Unseen Discovered). The annotated Arabic text is accompanied by an analytical introduction and an extensive subject index. This Qurʾān commentary is Ibn Barrajān’s last and most esoteric work, and as such offers the most explicit articulation of his mystical and philosophical doctrines. It synthesizes his teachings, drawn from a wide array of Islamic disciplines, and provides a link between early Sufism and Muslim mysticism in medieval Spain (Andalusia). The Īḍāḥ moreover is the earliest known work of its kind to make extensive use of Arabic Biblical material as proof texts for Qurʾānic doctrines.